In my past life as a VP of a national sales unit, I would create allegories to teach a lesson. My managers and I had fun performing the allegories in a meeting, or we’d include them as a general theme in our business plan. One of these was called “The Tale Of Three Farmers”. They were always well received. Many of our staff would ask when we were going to create another. I thought it would be fun share one these allegories. You will find it in written and podcast form. To view my very first podcast called “Tale Of Three Farmers” click on the link below. (Note: You may need to turn up your volume a bit to ensure you can hear the podcast to its best advantage.) Enjoy. There were three farmers you live near each other. Farmer Earl, Farmer Latt & Framer Fister. Farmer Earl rose early every day with a smile; worked his field, took good care of his animals, his newly planted seeds, and growing plants. Farmers Latt & Fister would rise late and visit other farmers to discuss their displeasure with Farmer Earl and any other farmer who wouldn’t join in. Every Saturday all the farmers would come together to shop for their needs and discuss the news from other farms. 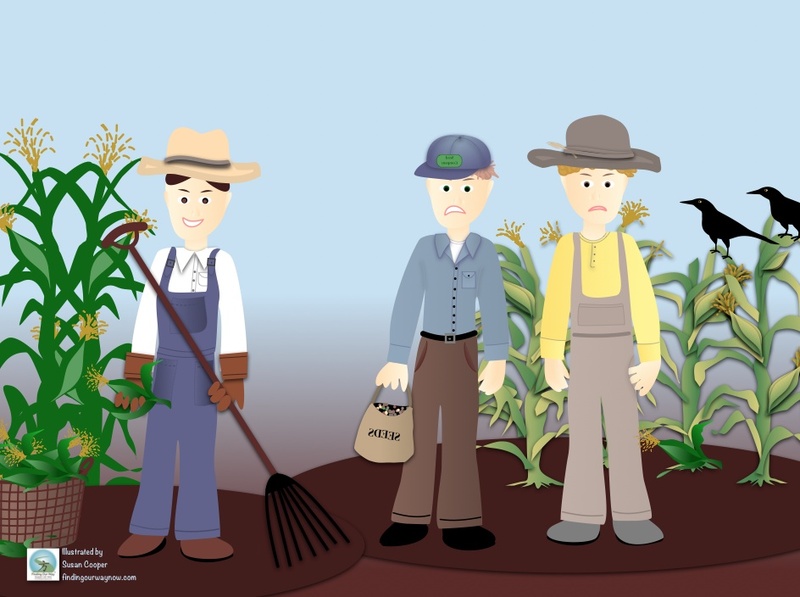 Farmer Earl would seek out other farmers to find out what had been successful or what had failed. Farmers Latt & Fister spent time discussing their woes, their bad soil, poor seeds, grumble about other farmers who had good luck and their plight with the crows. Aw, the crows, there were many and in competition with the farmers. They were pretty smart because they’d watch the farmers and would go to the farms that were left unattended. They found these farms to be the easiest to steal the newly planted seeds or to eat their harvest. 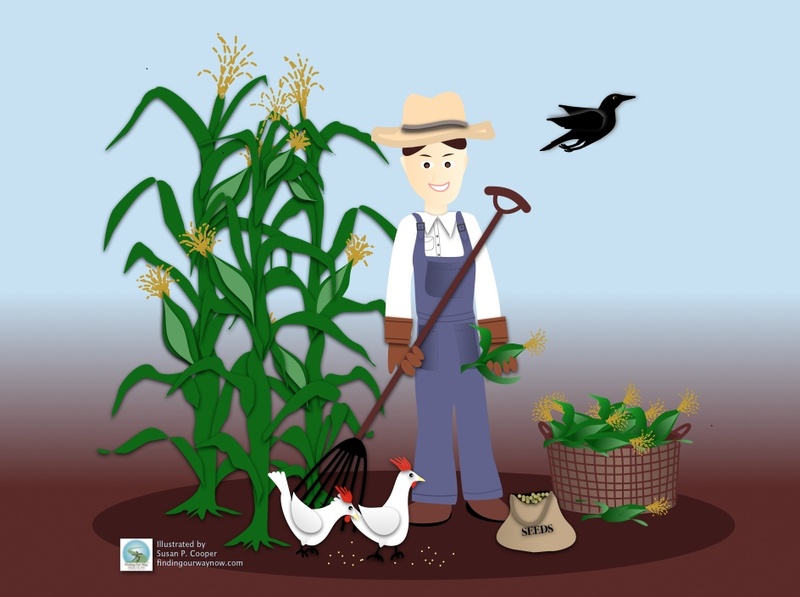 Farmer Earl would work or walk his fields and plant many seeds to ensure a good harvest. He knew if he did this he would spot early signs of trouble; enabling him to make any necessary changes or plant more seeds to ensure a good crop. He also knew he would be more successful at keeping the crows away from his seeds so that they would grow, thus keeping most of what he planted. All this resulted in having a great harvest. His good fortune made he and his family very happy. Because of his success, a great many local farmers sought out his highly prized advice. Farmers Latt & Farmer Fister had little good fortune and would meet with each other often to discuss their bad luck and complain about the other farmer’s good fortune. While doing this, the crows were able to steal a good many of their seeds or remaining harvest. Farmers Latt & Farmer Fister had some success, but generally their harvests were very meager. This went on for some time. Then news came to Farmer Fister that Farmer Latt was selling his farm. He was even more surprised to hear that Farmer Earl was going to buy Farmer Latt’s farm. This made Framer Fister very unhappy, so he went to Farmer Earl to find out why he would buy such a bad farm. Farmer Earl listened and then sighed. He stopped Farmer Latt from complaining and gave him this advice. – Plant many seeds because not all will grow. – Visit and work your fields often to spot trouble and scare the crows away. – Don’t make it easy for the crows to steal your seeds and eat your harvest. – Be patient, it takes time and effort to grow a healthy crop. – Seek out successful farmers for their words of wisdom and follow their advice. – Sometimes things fail. You’ll succeed more often if you work at it every day. When Farmer Earl finished giving his advice, he turned to work in his field, leaving Farmer Fister with his thoughts. The moral of the story, Tale Of Three Farmers, is obvious. We reap what you sow. What we’re willing to put into our farm (or life) is up to us and our success will follow suit. I have learned a ton making the Tale Of Three Farmers podcast. I had a blast creating the images, finding the sounds, the music, creating the opening and the close. I do hope you’ve enjoyed my podcast. I would love to hear your thoughts about my creation. I would greatly appreciate any feedback you may have regarding how I could make it better and more enjoyable for all you who visit and listen. My goals is to constantly keep improving so that your experience is the very best possible when you visit my site. What lesson have you learned from a story or allegory? How do you teach someone something of value? If you enjoy this check out Was That Really Today?, Judge a Book By It’s Cover and An Assumption, A Dog & A Rabbit.